"Our city belongs to all of us and we all have a role to play in making it the best it can be." We aim to Transform Freetown through 11 priority sectors using an inclusive approach, underpinned by innovation and data-driven performance management. On the 24th of January 2019 we launched Transform Freetown at the first Transform Freetown Forum. We were honored that His Excellency President Maada Bio gave his keynote address and excited to present our plan to the people of Freetown. You can re-watch our the livestream of the event on our Facebook page. 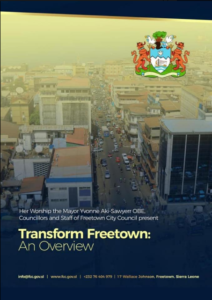 Below you can discover more about the challenges we are facing, how we initialised the Transform Freetown process and our targets & initiatives. Since 1787, when the city was founded, Freetown has been many things. 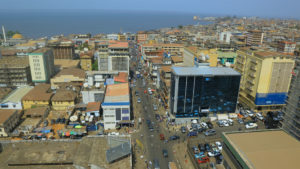 A haven for freed slaves, a trading hub, a World War II Naval Base, the heart of academic excellence in West Africa and in 1961 it became Sierra Leone's capital city and the seat of government. We are the largest city in Sierra Leone and home to our nation's legal, business and diplomatic communities. We are the engine of Sierra Leones economy, creating 30% of the country's GDP despite housing only 15% of its population, and occupying less than 0.5% of the national land mass. The city's natural environment is unique. Its boundaries are mountains, forests, rivers, and the Atlantic Ocean. Our city has the potential to be the most beautiful in Africa, and one of the richest and most dynamic, but we face severe challenges. We have gathered input from a broad spectrum of community stakeholders to ensure that the Transform Freetown priorities reflect the needs of Freetown and its residents. "The research that has gone into planning Transform Freetown is unique in Sierra Leone. The scale of it allowed for more inclusion and more participation than anything we have done before. We drew together data from a needs assessment conducted at zonal level, as well as direct observation of service provision, and interviews with service providers. It has set a benchmark for work in this field in Sierra Leone and we are already considering how we can build on it." The Transform Freetown priorities are grouped within four clusters - Resilience, Human Development, Healthy Cities and Urban Mobility. The task of the Working Groups was to set targets in each priority sector and design the iniatives necessary to acheive them. "There is real energy and enthusiasm behind the ambitious Transform Freetown agenda. By working together we can all play a part in making Freetown a better place to live and work."